August 16 was National Rum Day. It was also a fairly warm day. These two facts provided inspiration for me to make a Daiquiri. At some point, the name Daiquiri became associated with large, blended, sickly sweet concoctions, but the original recipe is a simple drink served straight-up. 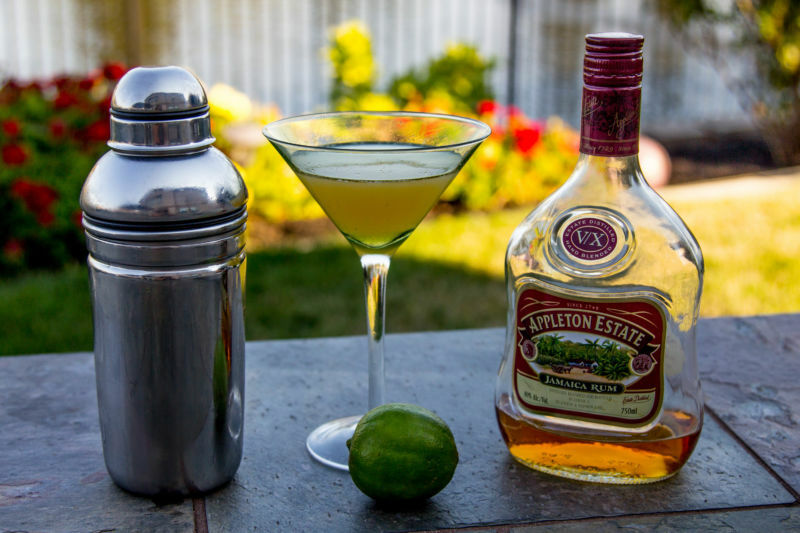 There are just three ingredients: Rum, freshly squeezed lime juice, and simple syrup. With over the half of the drink consisting of Rum it is a drink that allows a tasty Rum to shine. I love Appleton V/X, as it is inexpensive, but has more character than Bacardi or most other white rums. Note that simple syrup is made with equal parts sugar and water. You can buy it pre-made in the grocery store. California Girl Comments: I am a philistine! I like my Daiquiri’s with fruit like strawberry. Poor Brit, he has yet to get me to like the more sour type drinks.